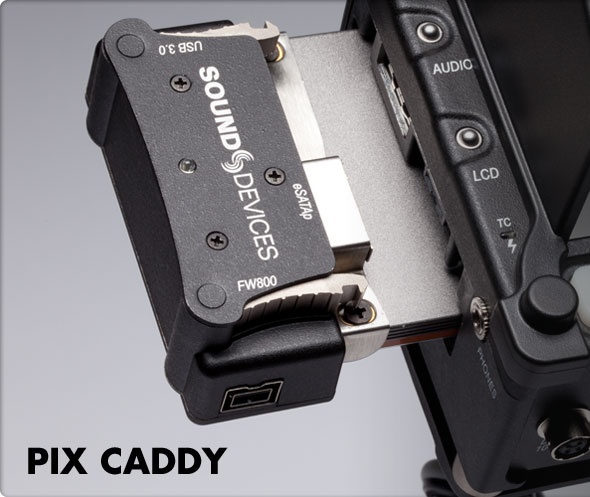 PIX CADDY2 provides a solid, removable connection for 2.5-inch solid-state drives (SSD) (not included) to attach to the PIX 220, PIX 240 and PIX 260 video recorders. Once secured to the caddy, SSD drives are quickly inserted and removed from the recorder. Firewire 800 (400 compatible) connection for mounting SSD to computers as UDF volumes when the caddy is not attached to a PIX recorder. USB 3.0 (USB 2 and 1.1 compatible) connection for mount- ing the SSD to computers as UDF volumes when the caddy is not attached to a PIX recorder. eSATAp connection for mounting SSD to a PIX recorder when the caddy is attached to a PIX recorder and for mounting the SSD to computers as UDF volumes when the caddy is not attached to a PIX recorder. 2) eSATAp High-speed data transfer over 5V eSATAp. Requires a 5V powered eSATAp port. 3) USB 3.0 High-speed data transfer over USB 3.0 (backward compatible with USB 2.0). 4) SSD Drive Slot Connector for 2.5-inch SATA II (3.0 gb/s) SSD drives. 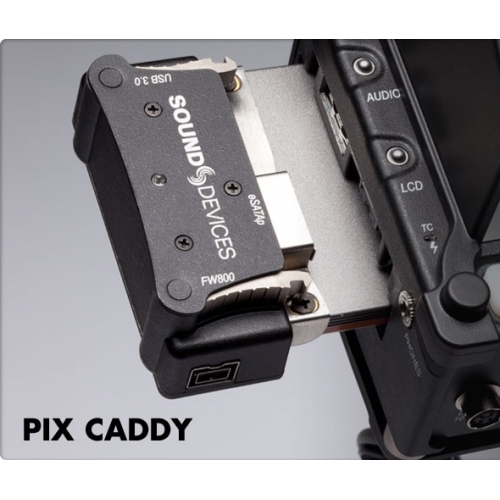 Sound Devices maintains a list of tested and approved SSD drives for use with PIX video recorders. Visit www.sounddevices.com/approved for an up-to-date list of tested and approved SSD drives. 5) Activity LED Illuminates when recording, playing, reading, or writing to the attached SSD drive. Do not remove the caddy while the Activity LED is illuminated. LED does not illuminate when connected to a computer’s eSATA port. 6) Release Latches Secures the PIX-CADDY to the recorder. Press both latches to remove the caddy assembly.